Once called the “Rosa Parks of legal education” by President Obama, Derrick A. Bell—the first tenured black professor at Harvard Law School—died Wednesday night. He was 80 years old. Bell—whose career at the Law School was marked by stands he took in favor of increased diversity—resigned from the Law School in 1992 in protest of the dearth of women of color on the faculty. Bell has been heralded as a legal pioneer of race and civil rights, writing and teaching extensively about his perception of race in America. His book, “Race, Racism, and American Law,” is now a common text in law school curriculums, and is credited with developing the Critical Race Theory—a theory that argues white people will not help black people improve their position until given incentive. Bell’s accomplishments in academia and activism took root before his career at Harvard began. Bell was born Nov. 6, 1930 in Pittsburgh, and was the first in his family to attend college, earning a degree from Duquesne University. After graduating from the University of Pittsburgh School of Law, Bell went to work for the Civil Rights Division of the U.S. Justice Department, resigning after being asked to rescind his membership in the National Association for the Advancement of Colored People. Bell was then hired by the NAACP, working with Thurgood Marshall to develop a legal strategy to fight school segregation in the South. Bell joined the Harvard faculty in 1969, receiving tenure two years later. He taught intermittently for more than two decades, leaving for a period in the 1980s to head the University of Oregan’s law school—becoming the first black dean of a law school that was not historically black. 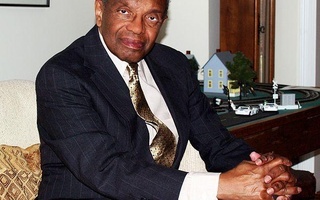 Described as soft spoken and articulate by former student and longtime friend Law School Professor Charles J. Ogletree Jr., Bell protested against the Law School administration several times during his tenure. He once staged a five-day sit-in at his office to protest the Law School’s refusal to grant tenure to two controversial professors. Ogletree remembered Bell as “a prolific, compassionate, and compelling scholar and activist” who was ahead of his time. Ogletree said that while student protests were fairly common, a faculty member protesting against the administration is something not often seen at HLS. “He was unique in making a personal sacrifice on the issue of diversity,” Ogletree said of Bell’s 1990 resignation. Since Bell’s resignation, Ogletree said, the Law School has improved the diversity of its faculty—granting the first black female professor, Lani Guinier ’71, tenure in 1998—but Ogletree said there is still room for improvement. In his final address before leaving Harvard, Bell emphasized the importance of standing by one’s convictions. “Your faith in what you believe must be a living, working faith that draws you away from comfort and security, and toward risk through confrontation,” he said. 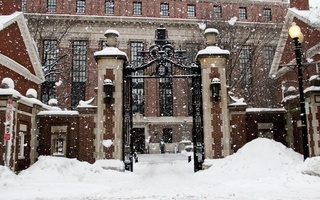 —Staff writer Caroline M. McKay can be reached at carolinemckay@college.harvard.edu. The 10th anniversary of the September 11, 2001 terrorist attacks this Sunday will see a number of commemorative events across the University. Harvard University has sued an Ohio bell company, Chime Master Systems, for installing a clapper that allegedly caused a 24 to 30-inch crack in the bell hanging in Memorial Church.